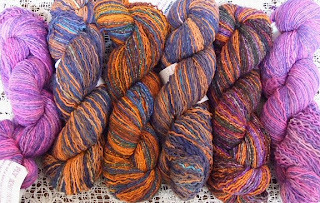 My good friend Pat Fly of Angora Valley Fibers asked me if I would like to take a very special treat with me to The Fabulous Fiber Festival.....Ofcourse I said YES Indeedy!! What's up, pray tell? 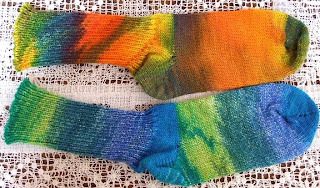 Pat's lovely Daughter Liz has been dyeing this incredible yarn...but wait, not just dyeing it...knitting it up on their sock machine, then dyeing it, frogging it and skeining it up....and Boy oh Boy is it beeeutiful!! Needless to say, Each one is a "one of a kind" treasure!! The people at Fab Fiber couldn't keep their hands off of them I am pleased to say! 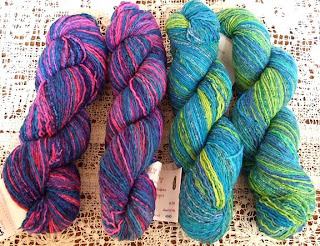 I do have some skeins left and I wanted to offer them to you before I merrily take them off to be sold at Oregon Flock & Fiber coming up here in a few weeks (September 22-23) in Canby Oregon. NO ONE will ever have another pair of socks just like the ones that can be made from this yarn. There's 4.5 oz in each skein...it's Sock Weight Merino Wool..."Machine wash cold, dry in the dryer"....7-8 stitches per 1". 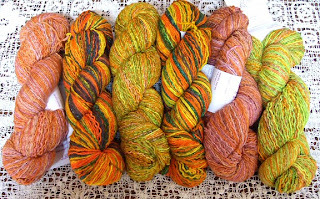 The price is $24.99 (plus shipping, around $3.00 for 1 skein).....a steal! You can email me at smernst@juno.com to order! This young woman has a beautiful color sense, as you can see.....gets that gene from her Mom I suspect! 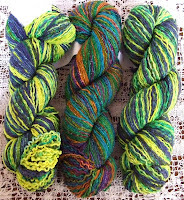 Unfortunately my photography of the yarn doesn't show how wonderfully rich the colors are....So you will be even happier when you receive your yarn! I will have another post in the next day or two to tell you all about our trip home. Keep good thoughts....I go off to get lovingly tortured by our sweet dentist tomorrow afternoon! Good thoughts comin' atcha! xoxo! Great job. I saw the yarn in person and it is very special!